South Australia’s next generation of female football talent are continuing to develop strongly through Adelaide’s Girls High Performance Squad. 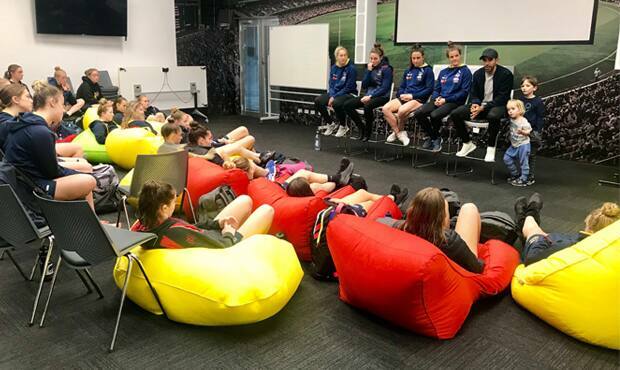 The group of emerging athletes benefitted from a special session with AFLW players Jenna McCormick, Sally Riley, Marijana Rajcic and Jess Sedunary together with AFL forward Eddie Betts at Adelaide Football Club on Thursday. The players spoke to the group about elite practises as well as sharing some of their experiences and tips for managing footy, work and their personal lives. The High Performance Squad, which was selected in March, comes together for monthly sessions which focus on physical and mental development, preparation and education. Crows 2018 AFLW rookie and Olympian Becchara Palmer is a mentor for the squad, which consists of about 40 girls aged between 15 and 18 years-old. With much of the squad having competed in the recent under age championships, the majority of the rest of the session focused on recovery – including a pool session, game review and meditation. Three of the Crows’ 2017 high performance squad members were drafted to the AFLW, including Eloise Jones and Jess Allan, who were impressive for the Crows in their first season, and Tait Mackrill who was picked up by Greater Western Sydney. Courtney Gum, the squad’s 2017 mentor, was also drafted to GWS. For more information about the Club's Next Generation Academy click here.